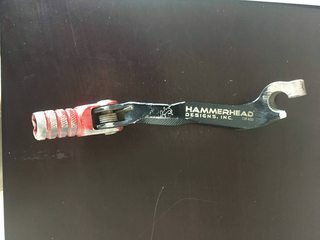 I got this shift lever - Hammerhead Designs - it is shaped differently and does not punch my side case (rocky trails seem to smash my shift lever into the side case) It's a different design, see pics. 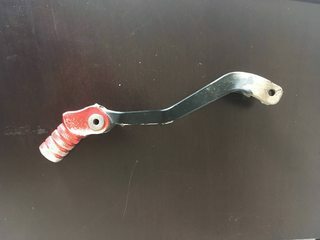 It does not have a sharp corner where the spring loaded shifter tip connects to the actual lever. So CRFS doesn't sell the same one I bought, so I just grabbed another one that looks the same. But it's not the same. Now I have the point again - and you can see the good hammerhead still hit the case, but did not have the ability to punch a hole. 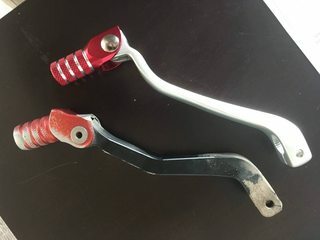 OK, so where can I find my old shift lever! or one like it! Actually, the hammerhead one had plenty of clearance, but was a little shorter. 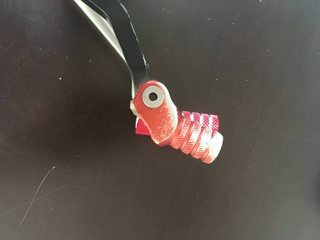 The way the spring loaded tip was shaped, it made it so there was no point to strike the case and punch a hole. I actually don't have a problem crashing on it, it's the tight tall rock situations. That punch with the factory shifter occurred by you near Phx... going up and down Red Creek to and from the Verde River. You're essentially riding up a tight creek bed and there are some tight spots where rocks come up and kiss your pegs going through. 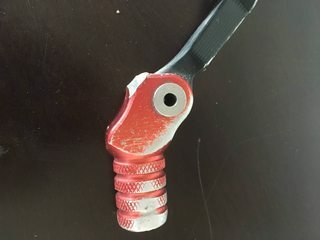 That hit was able to push the shifter into the case. It flexes and pops back out with plenty of clearance. For some reason I thought you were Phoenix. No problem. 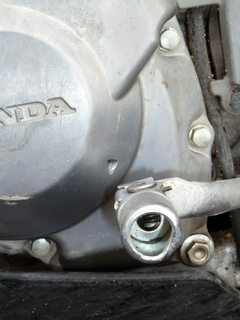 On the hammerhead site, they list part numbers that are the same for some x's and r's. I found a used one on ebay and I'm going to try that. 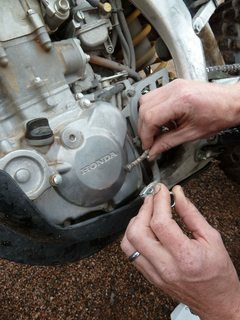 I don't have the cover on, just got the new stator from rickystator. When I put it together I'll try both shifters and see what looks best. I'll post pics.